New book from WJK explores Fearless Dialogues, a groundbreaking program that helps communities and organizations begin conversations that are so richly needed in today’s political and social climate. Drawing on all the community's collective voices —“from doctors to drug dealers”— Fearless Dialogues is a groundbreaking program that seeks real solutions to problems of chronic unemployment, violence, and hopelessness. Drawing on all the community's collective voices —“from doctors to drug dealers”— Fearless Dialogues is a groundbreaking program that seeks real solutions to problems of chronic unemployment, violence, and hopelessness. What began as a call to action on a radio station four years ago has grown into a grassroots organization and global movement. 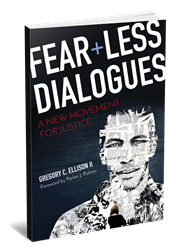 Gregory C. Ellison shares that journey in his latest book, Fearless Dialogues: A New Movement for Justice. By creating spaces for conversation, Ellison and the Fearless Dialogues team have worked with more than 20,000 people, including gang leaders in New Orleans, activists in Ferguson, heads of state in the Bahamas, and more recently, in partnership with schools and corporations. In Fearless Dialogues, Ellison illustrates how the program works and provides insights and practical approaches to some of America’s deepest and most intractable social needs. Gregory C. Ellison II, described by Publishers Weekly as "a theologian for our times," is Associate Professor of Pastoral Care and Counseling at Emory’s Candler School of Theology. He is the author of Cut Dead but Still Alive and the founder of Fearless Dialogues. He has dedicated his teaching, research and scholarship to bringing unlikely partners together to really see and hear each other, as a first step in changing the way people see themselves and the world —and maybe even changing the world itself.